I read blog posts by Don Dodge and Glenn Kelman today about people jumping from Google to Facebook and it got me thinking about entrepreneurs. Most people have an aversion to risk, my college economics professor told me. Which means they have to be rewarded to take on that risk. The higher the risk, the higher the possible payout has to be for people to jump. We make risk/reward decisions every day, all day. Do I go skiing, and enjoy the rush of flying downhill even though there’s a small chance I’ll blow out a knee? Should I go to college or just get a job and start earning money now? Should I eat the high fiber and generally healthy thing on the menu, or go for the cheeseburger? Should I hit the restroom before the movie starts? Etc. Every time we do something, or don’t do something, there’s a risk/reward algorithm being calculated in our brain. Entrepreneurs, though, are all screwed up. They don’t need to be rewarded for risk, because they actually get utility out of risk itself. In other words, they like adventure. The payouts for starting a business are just terrible when you account for risk. A tiny minority of entrepreneurs ever get rich. And the majority of entrepreneurs would probably make far more money, and have more stable personal relationships, if they just worked for someone else. In my youth I was a corporate lawyer, making a very nice salary for representing technology startups in Silicon Valley. There was a good chance I’d make partner after 7-8 years and could be earning maybe a million dollars a year by the time I was 40. All I had to do was work hard, and bring in clients. I was good at both. But I left the law after just three years to join a startup. And the reason I did it was adventure. I wanted to be in the game, not just watching it. My parents thought I was crazy. They still have no real idea of what I do for a living, and they were, frankly, pissed off that I spent their money getting a law degree, only to throw it away before I was 30. But I did it anyway. And then I left that company after a year to start my own company. And I’ve never looked back since then. That first company I started made a lot of money for the venture capitalists – nearly $30 million – but next to nothing for the founders. The companies I started after that varied between failures and mediocre successes. But at no point did I ever consider getting a “real job.” That felt like a black and white world, and I wanted technicolor. Also, I hate working for other people because I’m really bad at it. 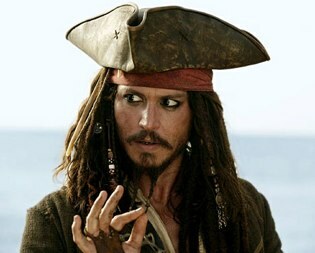 When I talk to non-entrepreneurs about the startup world I often use a pirate analogy. Not because I know that much about pirates, but the general stereotypes work well as an analogy. Why did some people way back in the 17th century, or whenever, become pirates? The likely payoff was abysmal, I imagine. There’s a very small chance you’d make a fortune from some prize, and a very large chance you’d drown, or be hung, or shot, or whatever. And living on a small ship with a hundred other guys must have sucked, even for the captain. But in my fantasy pirate world these guys just had really screwed up risk aversion algorithms. Unlike most of the other people they actually lusted after that risk. The potential for riches was just an argument for the venture. But the real payoff was the pirate life itself. Also, it was nearly impossible to be an entrepreneur back then. Now it turns out that most people in Silicon Valley are actually normal risk averse types. They carefully calculate the potential rewards of a startup before they join, taking into account stock options as well as salary. And also the resume value of a company. Some of the richest people I know aren’t really entrepreneurs. They worked at HP and then moved to Netscape when it got hot. They made a fortune and then jumped to Google and made another fortune. And now they’re jumping to Facebook. They may be very good engineers, or sales people, or marketing, or execs. But they ain’t entrepreneurs. They’re just resume gardening and they’re really no different from everyone else. I don’t care if you’re a billionaire. If you haven’t started a company, really gambled your resume and your money and maybe even your marriage to just go crazy and try something on your own, you’re no pirate and you aren’t in the club. That thrill of your first hire, when you’ve convinced some other crazy soul to join you in your almost certainly doomed project. The high from raising venture capital and starting to see your name mentioned in the press. The excitement of launch and…gulp…customers! and the feeling of truly learning something useful, you’re just not sure what it is, when the company almost inevitably crashes and burns. Now that person is interesting. That person has stories to tell. That person is a man who has been in the arena. There are lots of things that I will probably never experience in this life. Military combat. Being dictator of a small central American country. Dunking a basketball. Being a famous rock star. Or walking on Mars. But one thing I have been, and will always be, is an entrepreneur. And damnit that feels pretty good. Because if I was a lawyer right now, even a rich lawyer, I’d always have wondered if I had what it takes to do something a little more adventurous with my life than work for someone else.